Netflix says it has more to worry about than just an upcoming cable-free, standalone streaming service from HBO. The company claims it's also competing against pirate platforms such as Popcorn Time. Netflix made the comments in a letter to shareholders released earlier this week. 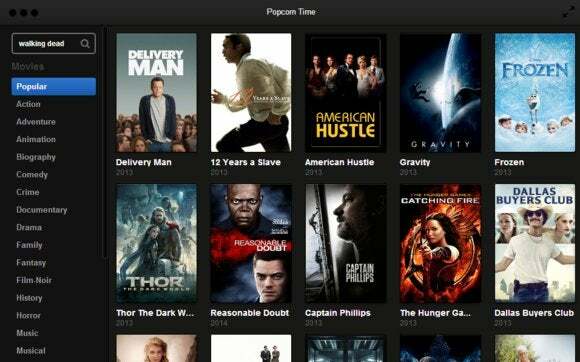 Popcorn Time is a piece of software that aims to make watching pirated movies as easy as it is to stream something on Netflix. Instead of typical video streaming, Popcorn Time is torrent based. The software temporarily downloads the movies to a user's computer, and then you end up sharing your downloaded bits with other users. To users, however, Popcorn Time functions just like you're streaming shows from Netflix or Hulu, with an attractive interface, near-instant responsiveness, and—since it's all based on illegal torrents, rather than legally licensed content—a vastly larger library than any individual legal streaming service. Popcorn Time first surfaced about a year ago in March. Since then the original group behind Popcorn Time disbanded and different groups are now distributing variants of the software. The story behind the story: Naming piracy as your competition is actually a good sign, although it may scare shareholders a little. Formulating a strategy to compete with a free platform helps you design an easy-to-use, high quality service. Netflix also isn't the first company to name piracy as the competition. Steve Jobs famously saw the same thing when music piracy was at an all-time high, and set out to turn iTunes into a music store that could offer a better and higher quality product than the free alternatives. Google Trends data showing the recent popularity of Popcorn Time in the Netherlands. To make its point that Popcorn Time is a concern, Netflix cites Google Trends data comparing the search terms for Netflix, HBO and Popcorn Time in the Netherlands. It shows interest in Popcorn Time jumping precipitously in recent months. The average interest also shows that Popcorn Time is about as popular as HBO for Google searches in that country. That data is just for one country, however. If you take a look at the United States with the same terms, Popcorn Time interest is relatively flat, and Netflix is by far the more popular search term. Looking at the same data on a global scale yields similar results. Naming piracy as a major competitor, then, might not be about concerns over the rise of piracy. Instead, it could be a strategy to convince content creators to distribute more of their content on Netflix lest it become hard to find and thus a top hit for pirates. That's not to say, however, that Popcorn Time isn't a popular service—at least for a piracy platform. In September, TorrentFreak reported the software had an install base of 1.4 million in the U.S., with 100,000 active users, making it the top Popcorn Time country in the world. The Netherlands followed second with about 1.3 million installs. Popcorn Time's numbers are a far cry, however, from the nearly 40 million subscribers Netflix has in the U.S. from its streaming and DVD-by-mail services.